Q :: I'm interested in seeing and potentially buying in Downtown Lake Stevens, now what? Q :: Are there more homes for sale in Downtown Lake Stevens than shown on this page? Or, the best way, easiest way and surest way to make sure you are finding homes for sale in the Cavalero area is to contact us directly and we can watch for property updates. Q :: Where does Persinger Group get information about Downtown Lake Stevens real estate? Q :: I'm a Downtown Lake Stevens Homeowner thinking about selling my Downtown Lake Stevens home. Can you tell me what you think my Lake Stevens home might be worth and what you do to market and sell homes? Downtown Lake Stevens is not about highrises and one way streets. In Downtown Lake Stevens, you will find a post office, the library and a market. Oh there is also North Cove Park. 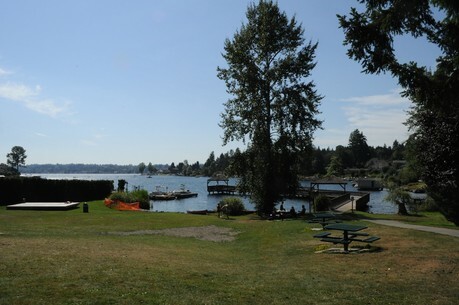 North Cove Park is a four-acre waterfront park at the northeast end of the lake, next to City Hall, offering easy access to downtown Lake Stevens. The park has a walkway along a grassy meadow from the parking area to a public boardwalk/pier. North Cove Park is the setting for several annual community events including Aquafest and Music on the Lake.